"Bringing Down The House" is a movie under the inane delusion that old and ignorant white people can be the least bit amusing when they're clumsily trying to act like hip and young black people. I can live with Steve Martin spouting out dialogue like "Yo Mama," but words still escape me after watching the lovely Joan Plowright transformed into an uptight and bitter little socialite, who in one scene unforgivably mocks slavery in front of Queen Latifah and then later finds herself sitting between two black men at the neighborhood bar puffing on a joint. Moments like these defy the essence of comedy not because they lack luster or even ambition, but because they're basically just clichéd plot contraptions designed to simply further along the formula. In a movie as obvious as this, we know exactly what is expected of people at specific intervals, and it's never very funny. 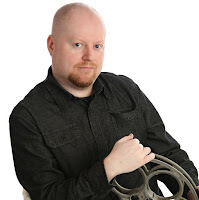 Martin plays Peter Sanderson, the kind of character who always seems rock-hard even though his interior mentality can be quite cushy. He's a tax lawyer assigned by his firm to secure the account of Mrs. Arness (Plowright), an heiress who brings her dog into restaurants when there are no pets allowed and invites herself to sit down to other peoples' dinners. She's a short-fused woman with only trusts people as old as her to handle her finances, and Peter delivers on everything she expects him to even when it compromises his personal life (or lack thereof). The simple solution: take up Internet socializing, of course. And just shortly after starting up a cyberspace fling with a woman claiming to be a criminal lawyer, he agrees to go on a blind date. Enter Charlene Morton (Queen Latifah), a recently-released convict who wants to use Peter as a prop to prove her innocence and clear her name. Sanderson, of course, refuses her demands because he isn't too happy that she turned out to be a rather ferocious-looking black woman instead of a drop-dead gorgeous blonde girl, but every time he tries to brush her off, she systematically finds ways to stick around, even if it means publicly undermining his reputation in the conservative white neighborhood he lives in (his across-the-street neighbor, an old crow played by Betty White, serving as a primary judge). Eventually, Peter agrees and begins to unravel the mystery behind Charlene's burglary arrest. Meanwhile, we get scenes in which Ms. Morton and Peter's partner, Howie Rosenthal (Eugene Levy), exchange street slang in their never-ending flirtations with one another, scenes in which Peter tries to tell his ex-wife Kate (Jean Smart) that he still loves her before he's always interrupted by a cell-phone, scenes where Peter's two kids get tossed in the background because dear old dad doesn't have enough time to be there for them, and even scenes in which Charlene tries to bring Peter's sense of behavior into the new century before he tries to win Kate back. The purpose? Surely not to further the story, of course; in fact, the whole notion of a plot becomes a mere afterthought during this stage of delivery, with Charlene's story arc almost disintegrating before it even gets started. Other subplots fall by the wayside, too, such as the one involving the rebellious nature of Peter's teen daughter, and one that involves Kate shacking up with a man half her age. But the biggest crime, even more than the fact that we don't have any sense of narrative here, is the fact that few of the jokes are ever funny. Yes, sometimes we smile. There is even a moment or two where we just glare delightfully at what the characters are exposing. But there's no genuine chuckles to "Brining Down The House" whatsoever, no outright jokes, effective sight gags or pieces of dialogue that result in any kind of uproarious cackling. The ball simply never rolls the way it is suppose to. 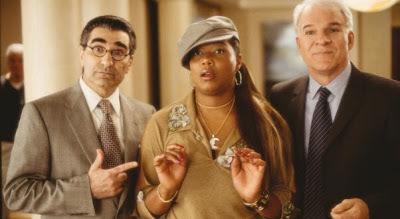 Queen Latifah and Steve Martin are likable actors with tolerable screen facades in this halfhearted picture, but beyond that, the house has been brought down far too many times for us to even care anymore.